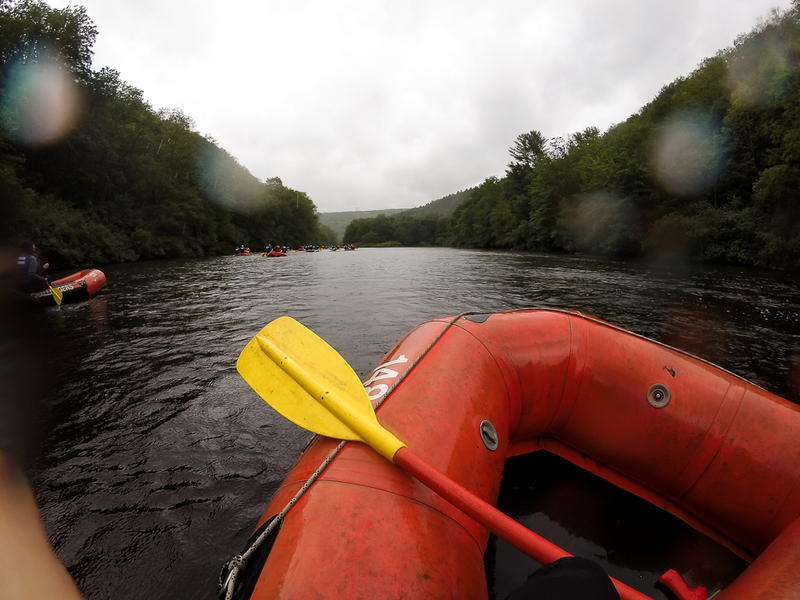 The weekend I headed to the Pocono Mountains happened to be a very rainy weekend. We were teased with a moment of sunshine Friday afternoon and then it was all grey skies and rain showers. When I woke up early Saturday morning it was dark and gloomy out the window. 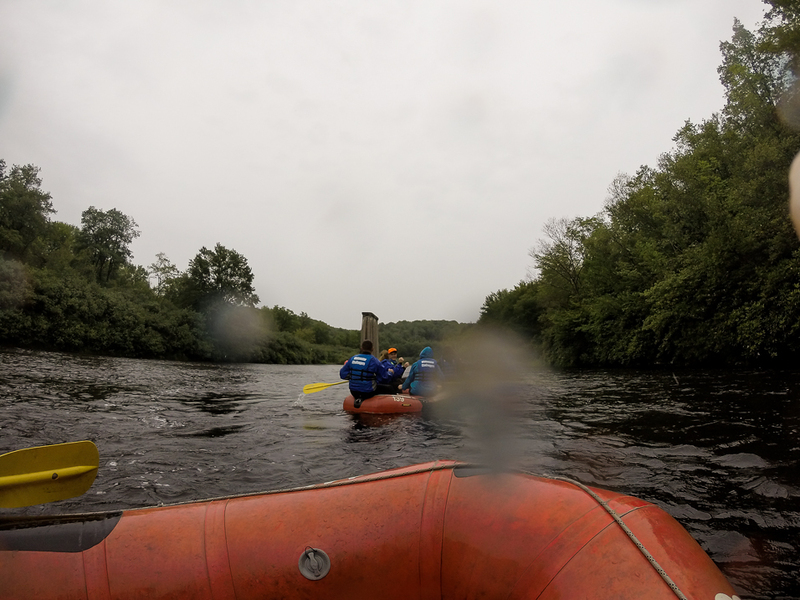 But as long as there was no thunder, we were still scheduled to go whitewater rafting on the Lehigh River. 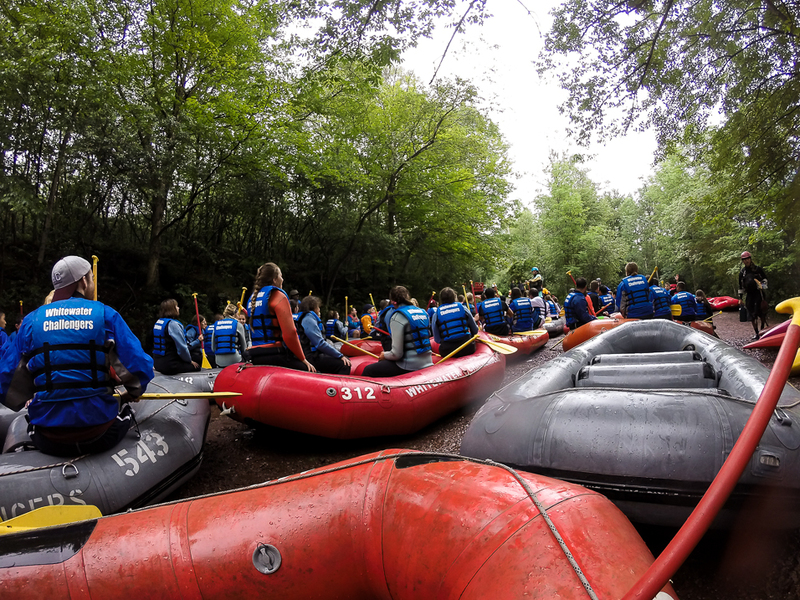 I’d always wanted to go whitewater rafting after my friends went northern california rafting and wouldn’t stop going on about how awesome it was! Today was finally the day! Outside our hotel, a bus was waiting to take our group over to Whitewater Challengers. We were greeted and walked back to a pavilion where they serve breakfast. We each grabbed a tray and loaded up with scrambled eggs, potatoes, sausage, pancakes and a bowl of fruit loops. I also grabbed a steaming styrofoam cup of tea to warm up. Sitting around the picnic tables, it felt just like a summer camp. After breakfast we each grabbed a slip and went to rent wetsuit equipment since it was so cold out. We changed and walked across the way to be strapped into a big blue life vest before boarding an old yellow school bus. A short ride later, we were dropped off at the river and handed a paddle each. Our group split into two rafts, and ours luckily got the expert. 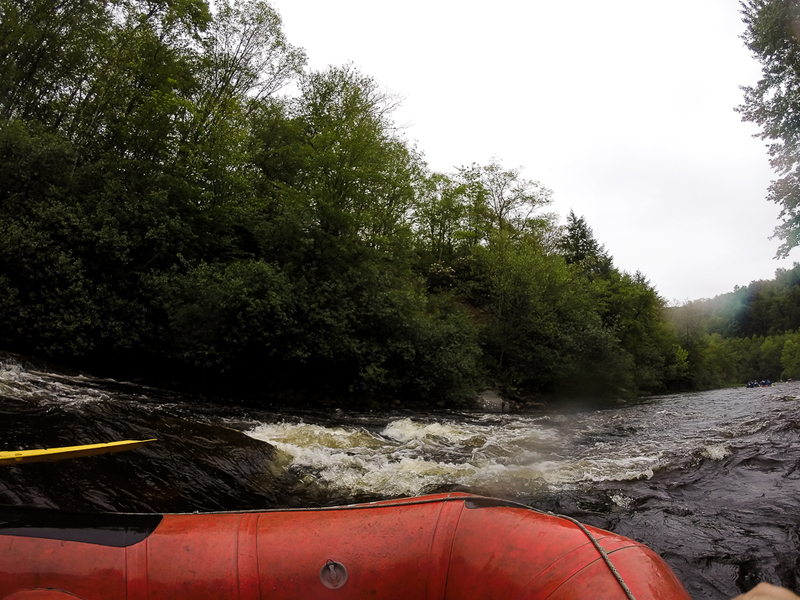 No one wanted to be captain and while the others pointed at me I assured them no one wanted to depend on me to steer the boat through the rapids. Plus I had to sit up front to use my new GoPro (no one needs to experience me steering). Within a few minutes we were off, and it only took a few more before we hit our first wave and got soaking wet. The river was warm, but the air was cold. If it weren’t for the wet suits we would have frozen. Not what you expect in June. 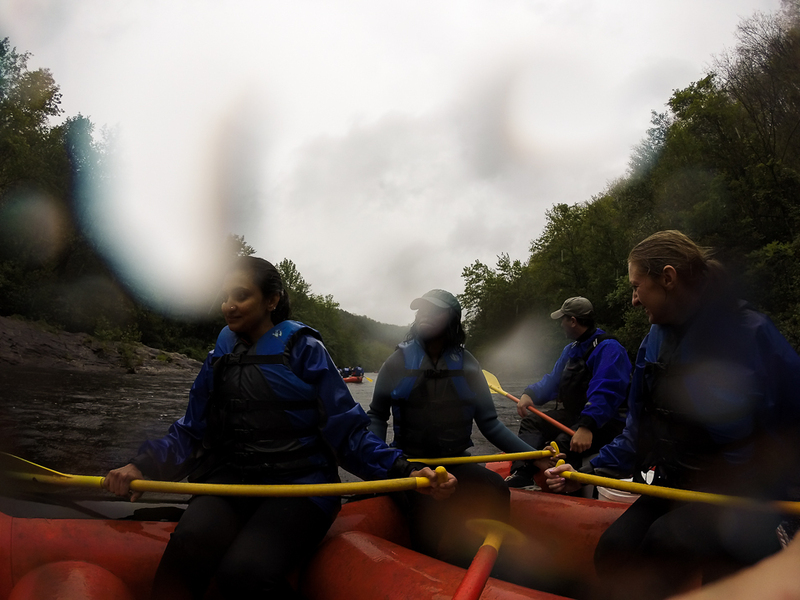 Rafting in the rain actually turned out to be quite fun. I mean, you’re going to get wet anyways. And the drizzle saturated the greenery so it really felt like we were floating down through a dense forest. 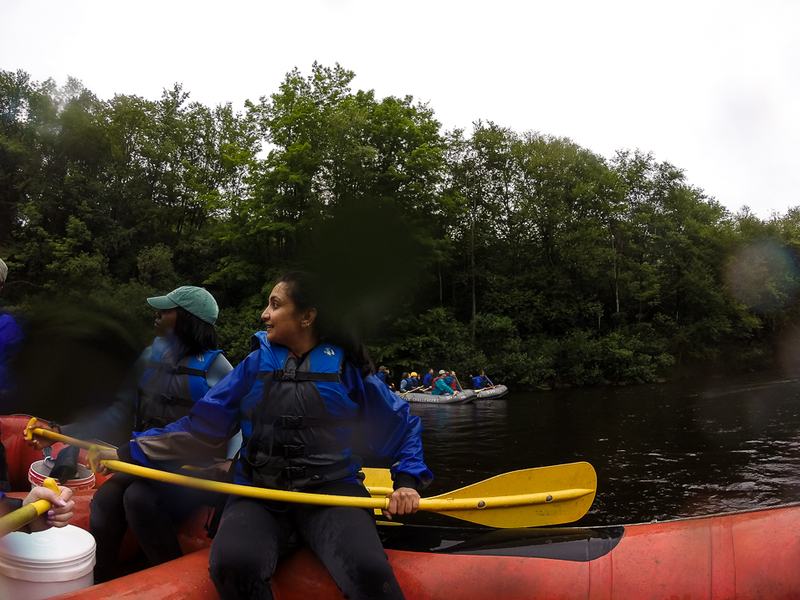 We weren’t the best at synchronizing our paddles but we didn’t get stuck on any rocks (thanks to our expert playing captain)! About halfway through, our boat sprung a leak and we periodically took turns bailing out the water. The raft was fine though. I assume it is built to handle water since the rapids are frequently pouring over the sides. We stopped for a bagged lunch but quickly returned to the water. It was much colder standing still. Back in the boat we paddled in almost complete silence, trying to warm back up. Just as we reached the end the rain really came pouring down. 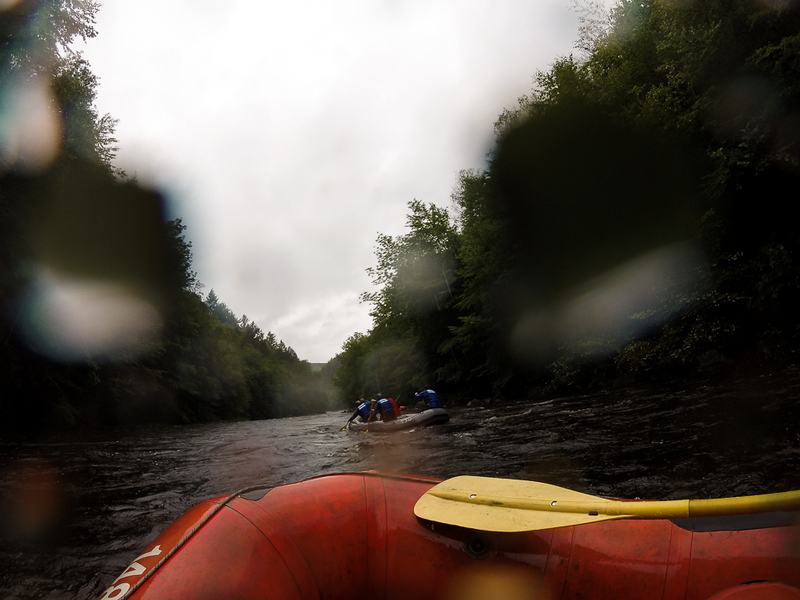 We jumped out of the raft, handed back our paddle and huddled onto the bus. The heat never felt so good and we asked the driver to turn it up. Within a few minutes the windows were so foggy we couldn’t even see out. Back at the camp we changed back into clean, dry clothes and popped a bottle of champagne for our efforts… and survival. (Almost) just like summer camp.